Thing's happen that prompt me to be writing on my blog again. I hear from dear Lori at Humble Quilts http://humblequilts.blogspot.co.uk/that her mum has passed away after her long struggle with Alzheimer's. It's such a cruel disease that not only robs someone of their mind but robs a family of the person they once knew. Recently an unbelievable thing happened with Di Ford Hall contacting me to ask if I would like her Rotherfield Grey quilt to raffle to raise funds for The Alzheimers Society. I cannot tell you how overwhelmed I am with this generous donation. Those of you who in my early blog days followed my journey with my own husband's Alzheimers illness know what this offer of raising some funds for the charity means to me. This horrible illness dosen't discriminate when it comes to age as my husbands begain at the age of 52. If you think you would like to buy tickets for this worthy cause please email me. Tickets are 1.00 each or 5.00 a book of 5. It will be drawn on the 19th November at Cowslip Workshops by Christine Butler from BBC Spotlight and Radio Cornwall. I can receive money through PayPal for overseas participants but would have to send you a photo of your ticket numbers through email. Di has kindly offered to pay for the shipping too so please support us in our bid to raise as much as we can for the beautiful quilt for the benefit of The Alzheimers Society. Here is Rotherfield Grey quilt that is featured in Di's book Primarily Quilts published by Quiltmania. Thank you all and please keep Lori in your thoughts and prayers at this difficult time for her. Labels: Alzheimer's Di Ford Hall. Back again to finish off my last post. On our way to Bennington we took the back road and crossed through this lovely red covered bridge. It the one Diana Keaton drives through in the film Baby Boom when shes on her way to her new life in Vermont. I love that film especially when she is dancing to Moonlight in Vermont. Oh I'm such an old romantic !!! So here we are at the Bennington Museum and after visiting VT 5 times I've finally timed it right and at last I get to meet Jane. She really is a work of art and in fabulous condition. Very dark in the museum where she is displayed which is fair enough given her age and them wanting to protect her. Their was this other beauty in there too but the only information was that it was gifted. We saw so many pumpkins along the way and couldn't resist having my photo done with this guy. Its time to say goodbye to The Inn at Manchester. We stayed in the red barn building at the back overlooking the pool. I love staying at this Inn. We then headed for Concord for our last afternoon and payed a visit to Orchard House . Such a shame no photo's are allowed as their are a few small quilts in the bedrooms. So now it was finally time to say goodbye to New England once again. As for 2016 I am going to try to do at least one post a month, I find I spend most of my time hanging out on Facebook and Instagram these days, Its so quick and easy. Its now time to wish you all a very Happy Christmas and a marvellous 2016. Well it has been a long time and at the busiest time of the year I thought I would squeeze a post in. Its those little people they keep me really busy and if they want to go out to play I'm up for it, As we all know time flies and already Abi is at pre-school and Max is 20 months and running, yes literally running and climbing everywhere. So not much to report on the sewing front, Still buying fabric like you do and before long both those little ones will no longer be able to come out to play so I will get back to sewing when I can. I had a lovely holiday in New England in September. I went with a friend who is not a quilter but loves crafts so she did indulge me a few quilt shops. So here I am at The Busy Thimble in Litchfield Maine, Cyndi does have lovely fabrics and I bought some of Di Ford's Cloverdale range from her. Your heart misses a beat when you go through these doors and its hard not to want every single fabric. I also let Wendy The Constant Quilter know I was going to be there and it was nice to put face to blog. Cyndi's blog is The Busy Thimble. Its been so long since I've blogged I'm not sure how to link. We drove from Maine and this is a must stop Polly's Pancake Parlour in New Hampshire but oh my how it has changed since my last visit. The pancakes were just as good but the new building doesn't have the charm of the old one. I believe it was practically falling down, Well that's progress for you. We stopped over near Burlington one night and carried on to the Shelburne Museum and I've photographed these two before and go to say I love the top one especially . We then drove on down to Middlebury and by pure chance came across the Sheldon Museum which had an exhibition of Warren Kimble's works and objects from his private collection. They also had this most gorgeous quilt on the bed upstairs. We moved on through Vermont driving through beautiful countryside, passed by lakes and old barns. We stayed at the lovely Inn at Manchester for the remainder of our stay. I love this place a real family run business and they always make you feel special. So this is what has now happened and why I get totally frustrated with blogger It wont let me load any more photos. I'm going to have to leave it here and will make a pledge that I will get back and finish this little story off with some nice photos of the Dear Jane quilt. I've had so much on lately their has been no time for blogging but today I have loads to report on. After Nantes Di Ford payed another visit at my home. Its always so nice to have Di here along with some very excited ladies who hadn't seen each other for a while. The new project started was Pendle Hill whilst some choose to carry on with their Sutton Grange or Jane's Garden. Its always a nice day where everyone contributes a dish for lunch and that is another treat in itself. Heads down and all very busy. We had a little show and tell with a couple of quilts that Di would be going on to teach at Cowslip Workshops. Di is remaking the Mount Mellick quilt in red and again this is a winner. Shirley from Stitchery Do Blog brought along her Sutton Grange which is coming along nicely. 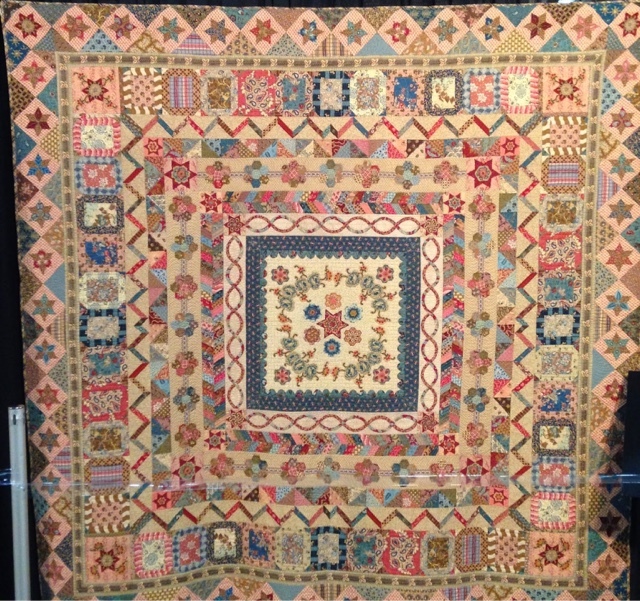 Here is my Sutton Grange, I have changed the Drunkards Paths to Broken Dishes and am piecing the next border too rather than applique. All the outer block now made I need to get sewing! Thank you Di as usual we all had a marvellous day with you and we learn so much. A little more progress on my Abigail Rose quilt. Not to many more of those hexes to make. Back from the Longarm quilter has come my Texas Stars. As always Sandy has done an amazing job. Thank you Sandy you really know what I like. And here we are at Quilts UK a couple of weeks back. I took Abi along with me and she posed beautifully for me in front of my Jane's Garden which got Judges Merit. She was so sweet, mummy had told her she was going to a quilt show. As we left the show she said but I haven't seen the show. Bless her she thought their was going to be some sort of singing and dancing event. I forgot to show you these lovely gifts I received in Nantes from Linda, Randi, Ellen and Sue. Finally today's gift in the post from Di Ford this gorgeous book with fifteen wonderful quilts in it. I Face booked Di to thank her and said if I had known what was in the parcel I would have kissed the postman but he really isn't my type and am sure he would have run a mile! I've had a busy month and better get back to some sewing.